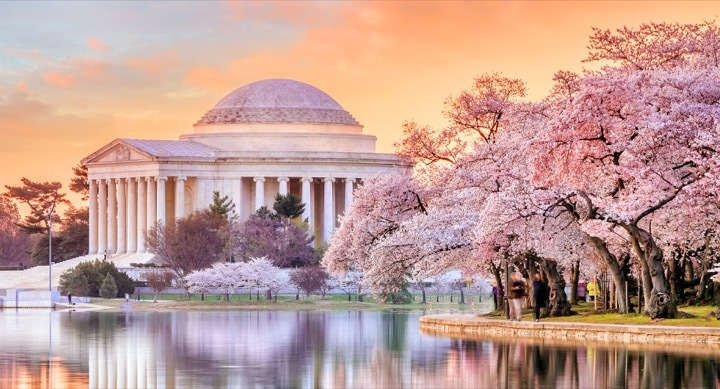 ToursByLocals Blog - Cherry Blossom Festival in Washington, D.C.
Today we welcome our Washington DC-based guide Ken, who joins us to offer the inside scoop on DC’s famed Cherry Blossom festival – starting this week! Springtime is rapidly approaching, which means the famed cherry blossom spectacle in Washington, D.C., is just around the corner. To celebrate the big bloom, the 2019 Cherry Blossom Festival runs March 20 through April 14, and as you might guess, marks the beginning of the busy season. A ton of blossom-themed events are on the calendar, including the annual pink-tie party/fundraiser (3/22), kite festival (3/30), fireworks at The Wharf (4/6), Cherry Blossom Ten Mile and 5K Run (4/7), the festival parade down Constitution Avenue (4/13), and the largest Japanese cultural festival in the U.S. (4/13). During the festival, you'll also find various street performances, kids' activities, and live music both indoors and out. The peak bloom typically lasts about a week, and though it's not entirely predictable, it reliably occurs between mid-March and mid-April. Your best odds are toward the end of March and beginning of April, earlier if the weather trends mild, or later if the grip of winter hangs on. Experts with the National Park Service do their best to predict the bloom each spring but almost invariably, the weather changes at the last moment and the blossoms emerge earlier or later than expected. That makes trip planning a bit of a challenge. But not to worry! Some areas bloom earlier or later than others, and the lead-up to peak bloom is also quite colorful if you happen to arrive early. There's also a succession of floral blasts to be found around the city, from daffodils, tulips, and cherries, to magnificent magnolia trees, azaleas, and more, offering endless opportunities to experience the burst of vibrant spring color in the American capital. Native and ornamental gardens also come to life in April and May, and these too are often included in walking tours along the National Mall and at the National Arboretum. The gardens and stories behind them can provide a nice reprieve from all the neck-craning below those awesome monuments and memorials. As for the cherry blossoms, check the National Parks link above for some background on Tokyo, Japan's generous gift of 3,020 cherry trees that first adorned the scrappy shores of the Tidal Basin over a century ago. Then get out there and see it all for yourself. Miles of walking paths provide easy access in any weather. If you catch the peak bloom, you'll see dense clusters of blossoms seeming to explode from every branch and twig in a cataclysm of pinkness, and in nearly every shade possible, from rosy-white to magenta. Early morning light, starting, say, an hour before sunrise, can be a photographer's dream. Though you won't be alone, the quiet peace adds a dreamy dimension that's lost as the crowd of amazed onlookers begins to build. Otherwise, you might consider a mid-afternoon or early evening tour when the crowds tend to thin out some. One of my own favorites begins with a sunset walk amid the cherry trees, followed by a magical evening stroll among the great memorials. But really, the blossoms are a must-see anytime of day, and a legendary D.C. experience not to be missed. Want more info on the season? Check out the sites for the National Cherry Blossom Festival or the Cherry Blossom Watch. Thanks Ken, for the tips on everything blossom-related in DC this spring! If any travellers are headed to the capital in April (or anytime in 2019), send Ken a message and he'll take you on a fabulous tour that explores all Washington DC has to offer.